It’s been seven years since Windows unveiled Bing, and since then, the search engine and the teams behind it, have made strides to catch up with the behemoth, otherwise known as Google. Just in the past few months, new features have included a ‘Popular Content’ section showing you the most visited content sections from a website or web page, completely redesigning the Android version of its search app and including augmented reality, and even adding Game of Thrones content in preparation for the season 7 premiere. Perhaps even Windows 10 could have had a big effect since Bing is now integrated throughout the entire desktop OS. Little by little, those efforts are bumping Bing’s numbers up. In comScore’s latest rankings for search on desktop, Google slipped .3 points while Microsoft (Bing) rose by .2%. In an amended deal struck in mid-2015, 51% of Yahoo’s desktop search traffic has to carry Bing ads, giving the search engine even more clout. Of course, there’s still a huge difference between Bing and Google’s overall share of search, but Bing’s influence is larger than most people think. While the majority of people are hanging out on Google for their searches, being among the crowd isn’t always the best bet for marketers. In fact, Bing offers many advantages over Google. Using an example from digital marketing agency ymarketing, keywords “mens boardshorts” gave them a CPC of $0.48 on Bing compared to $1.35 on Google, for a cost savings of 64%. Fewer people to go up against means lower costs for marketers. You’re also more likely to get better placement since not many marketers are including Bing on their media mix currently. When setting up an AdWords campaign, Google locks you into network, location, ad scheduling, language, and rotation settings at a campaign level, and ad groups are held to those restrictions. The only way to get around that is to set up a new campaign with different parameters so that you can extend the filters to ad groups. Bing allows you to adjust all those same options at any level, as well as assign different campaigns time zones, which could be a crucial factor for global clients. Bing’s got nothing to hide when it comes to search partner targeting. Not only can you target just Bing & Yahoo, just search partners, or both, but you can also see who the search partners are and drop any partner who’s not giving you the numbers you want. Google, on the other hand, lets you target just Google, or Google and search partners, and refuses to pull back the curtain to let you see who the partners are, let alone adjust bids or exclude anyone. In the first quarter of 2016, Bing announced Social Extensions, which are “placed under your ad copy that direct potential customers into social conversations on Facebook, Twitter, Instagram, and/or Tumblr. Searchers click on the extension and are directed to the associated social account or social post.” Bing also shows participating advertisers’ Twitter followers in ads to give additional validity to a business with which a customer might not be familiar. In AdWords, you can set demographic targeting on the Google Display Network, but that control doesn’t extend to search. With Bing Ads, you can set the gender and age of who you want to see your search ads. Now that you’ve seen the ways advertising on Bing can be beneficial over going the traditional Google route, hopefully, any skepticism about the underdog search engine has dissipated. Now let’s take a look at Bing’s targeting capabilities and how you can use them to your benefit. According to Microsoft, Bing Ads and the Bing Network reaches 167 million unique users who spend 26% more online than the average internet searcher. Those are some pretty enticing numbers considering you can get much lower PPCs, too. Bing’s targeting capabilities aren’t drastically different from what Google offers, but they’re still worth taking a look at to fully understand them and determine how to use them to shape your campaigns. Bing provides a Keyword Planner (you’ll need to have a Bing Ads account and be signed in) that suggests keywords based on insights from historical trends and marketplace competition. You’ll need to start with your own seed list of keywords that you’ll input into the planner, as well as the URL of your website or a page on your website, and a category relevant to your product or service, then you’ll get a list of suggested keywords from Bing. From there, you’ll also see a bid landscape for each keyword where you can make decisions on what to go after. With Bing, not only can you show a store address in your search ad, but you can also specify a radius within a city or U.S. ZIP code in which to target your ad. This capability lets you focus your ads on search users who live close to your store. Bing gives another example of location-based targeting using the keywords “Seahawks jerseys.” As you can see in the graph below, it’s no surprise the most search traffic comes from Seattle, followed by California and Oregon. With this data, you can make sure you’re targeting these areas exclusively, or bid appropriately to ensure you’ve always got ads up in your strongest regions. Once you have enough historical data through your campaigns, Bing will show you location based bid adjustments which are suggestions on how to tweak your account to get more from the locations that are responding best. Bing will do all the translating for you. When setting up a campaign, all you have to do is select the most common language in the region you’re targeting, and Bing will make sure your ads correlate to the language of the end-user’s web browser settings. With Bing’s scheduling tool, you can parse ads out in 15-minute increments. If your campaign is focused on getting customers into a brick & mortar door, you can also set ads to run only when your store is open. 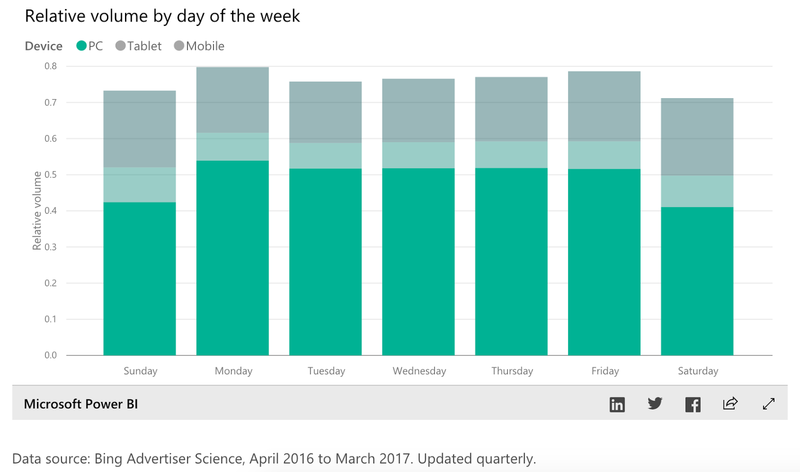 Bing averaged its user data to come up with helpful trend charts showing volume by hour and days per device. You can limit where you want your ad to be seen – mobile, tablet, or PC. Bing has another helpful interactive graph that shows click-through rate, cost per click, and volume by device type and industry. It’s a great way to get a glimpse at what competitors are doing, and also set your own bar. In addition to the default HHI, education, and marital status, you can also target demographics like age and gender, which can offer some tailored opportunities when it comes to your ad creative. Don’t miss out on interested customers. Bing lets you remarket to customers who have visited your site but may not have converted. We’ve preached before (and we’ll do it again) about the importance of varying your media mix. Bing, with its large, engaged audience and low PPCs offers a great opportunity to experiment with a search engine you may have previously overlooked.